Looking for the best Copyscape alternatives for 2019? 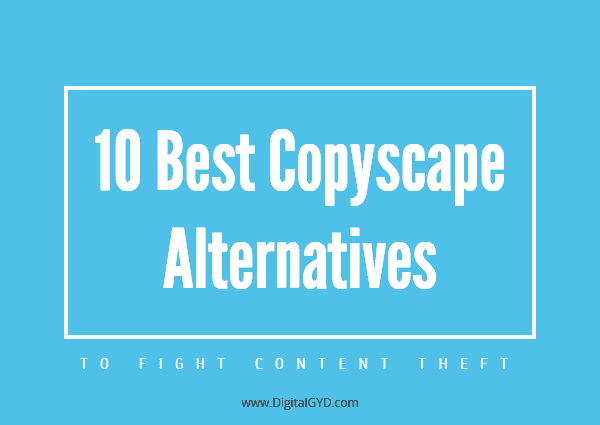 In this article I’ll review and recommend the best alternatives to Copyscape (both premium and free). Copyscape has been preventing content theft and content fraud since 2004. It helps bloggers and publishers you quickly scan and detect unoriginal, plagiarized content easily. You can also create watermarks and add banners on your website to deter content theft or scraping. As much as I like what Copyscape does offer, you must shell a good amount of money to avail these which is somewhat not possible for bloggers and publishers. Let’s check out the most popular premium and free Copyscape alternatives that are a bang for the buck. Most of us know Grammarly as a tool that provides us with the opportunity to proofread our content and correct grammatical errors. But there is more to this fantastic grammar checking tool! On top of grammar checking, it comes packed with a powerful plagiarism detector. Grammarly’s plagiarism checker is available as a part of the premium package that comes with additional features. While the free plan will help you check and correct spelling mistakes and grammar errors, the premium version lets you experience Grammarly’s full power! To use it, you will need to turn it on in the dashboard. It is ideal for college students that have cited too heavily from other sources. If you have freelancers writing on your behalf, this should be your go-to-tool, as it allows you to check grammar and plagiarism on the go. As a blogger who outsources a lot of content, Grammarly is my go to plagiarism detection service and all content goes through it before getting published. I’ve reviewed Grammarly’s plagiarism checker where I have real user reviews and opinions from writers and bloggers using it. Make sure to check that out here. Available online (as browser extension), as MS Word Add-in, mobile apps. Trusted by brands like Dell and universities like University of Phoenix, Illinois to name a few. WhiteSmoke is undoubtedly the No. #1 Grammarly rival! Just like the latter, WhiteSmoke features a language and grammar checking tool with an inbuilt plagiarism detector. Its effective plagiarism checking features makes it stand among the best and most useful Copyscape alternatives. WhiteSmoke will detect duplicate content. WhiteSmoke is suitable for anyone who is involved in academic writing and research works. While the plagiarism detector will help you avoid academic penalties, the grammar checker will correct all your spelling and grammar mistakes! WhiteSmoke prides itself as an all-in-one English correction software for a reason. On top of the plagiarism and grammar checkers, Whitesmoke helps you improve your writing style and translate full texts from over 50 languages. Video tutorials for easy on-boarding and usage. You can use it online across all browsers and as standalone desktop and mobile apps. ProWritingAid is a great personal writing coach that offers a complete writing experience. This writing assistant software features a grammar guru, writing mentor, and style editor as a single package. To complete the writing coach package, ProWritingAid features an inbuilt plagiarism checker. I’ve written a detailed review of ProWritingAid along with all features and how they can help you fasten your process of error-free writing. Make sure to check it out. ProWritingAid Plagiarism Checker lets you check your content against over a billion other published works, including academic papers and web-pages. To use this add-in feature, you will need to either get the Premium Plus version of ProWritingAid that includes 50 plagiarism checks per year or purchase the plagiarism checks independently in the premium version. You can choose to purchase packages for 10 checks, 100, 500, or 1,000 checks depending on your checking needs. The higher the package, the lesser the spending. But I don’t see the need of buying 500 checks if all you need to check is a few research papers per year. ProWritingAid boasts of a user base of over 700,000 that span from authors to copywriters to students as well as professionals and editors. You can sign up for free, but it is limited to only 19 writing reports, 500 words editing at a time and online use only! The ProWritingAid Premium rids out the limitations by giving you a full editing power. There no word count limits when checking grammar, you get a chance to edit where you write and enjoy other amazing features. You can choose to get 1 year, 2 years, 3 years, or lifetime access. Best for creative writers like script writers and novel writers. Word explorer and contextual thesaurus. Available as desktop apps (Mac & Windows), browser integrations and MS Word add-in. Plagiarisma stands out as a free copyscape and Turnitin alternative. It comes with other content editing and correction features including a Grammar Checking tool, an Article Spinner, and Google Books and Google Scholar plagiarism checkers. It is decent in detecting and pointing out copyright infringements in coursework, dissertation, research papers, and essays. Available as a website, free Windows application and Moodle plugin. If you’re looking for a portable plagiarism checker, they do have an android app too. Enter URL of the live blog post (to check duplicate content) or upload supported files. This anti-plagiarism tool stands out with its two distinct features. One, it is free for life, and two, it only works as a plagiarism checking tool. Unlike other Copyscape alternatives we have discussed before, Plagiarism Checker doesn’t work beyond checking duplicate content! Plagirism checker dons a minimalist interface. Using the tool is pretty easy! All you need is to paste your content and click on the “Check Plagiarism” button. Plagiarism checker shows you the percentage of plagiarized material, parts that contain copied content and the links to original sources. Easy for beginners to regularly check their blog posts and find where they’ve been used by content scrapers worldwide. While other Copyscape alternatives in the list help you detect plagiarism, CopyGator helps you deter content scrapers by regularly analyzing your feed and alerting you when someone ha copied and published your site content elsewhere. CopyGator is a completely free alternative to Copyscape’s premium Copysentry feature. It also offers you badges to place on your site to discourage content theft. Free tool to monitor your RSS feed and report your site’s content published elsewhere on the web. You can enter a specific feed (your site’s, for example) and CopyGator will monitor content duplication (of old and new posts) throughout the blogosphere. Free badge to add to your site that changes color to alert you when someone steals or copies your site’ content. Plagiarism Detector has a lot of likeness with Plagiarism Checker. Just like Plagiarism Checker, this tool features a simple dashboard. All you need is to paste your content and click the “Check Plagiarism” button. It has a limit of 1,000 words per every search. You can also opt for uploading a file or enter an URL if you would like to check an already published page. The final report will show the percentage of unique content and the plagiarized text. Plagiarism detector is ideal for article writers who would like to ascertain their content is unique before publishing. The fact that it is free and simple means that it isn’t the best tool for authors, copywriters, and academic writers. Dustball is another easy to use plagiarism checker tool that can safely be used as a Copyscape alternative. If you’re looking for a paraphrasing checker Dustball is something you should try. Dustball’s plagiarism report is similar to what Grammarly provides and can be used in as an additional proof for your content submission. Whether you’re a writer or a student, submitting a Dustball plagiarism report alongside your completed project will not only lessen the work of your client/teacher but also will impress them and boost your credibility. Provides you with a plagiarism report for easy submissions. Premium version promises 3x the accuracy and costs $8 per month. Duplichecker is arguably the best plagiarism detection tool that offers free plagiarism checking. Duplichecker packs additional features including grammar and spell checking tool. You will need to sign-up for the free version to avoid the irritation that comes with entering capture codes each time you use it. Duplichecker’s simple interface helps users detect and fix plagiarized texts on the go. All you need to do is paste the text or upload a DOCX/text file and click the “Check Plagiarism” button. 50 searches of 1000 words each. Closing our list of Copyscape alternatives is Quetext. An advanced plagiarism checker that doubles as a citation assistant. While this tool isn’t as prominent as the others on the list, it packs some amazingly great professional features. Quetext boasts of attracting the trust of over 2 million teachers, professionals, and students around the globe. Its free version will search your content against other billions of files and similar pages online. With the free version, word-limit per search has been capped at 500 words with only 3 reports and 3 search limits. However, the PRO version unlocks other amazing features like the DeepSearch™, which is a technology used by most of the reputable plagiarism detectors. It checks your text online against other 35 billion web pages, 20 million books, and over 1 million journals. I’ve a detailed review of Quetext that you should go through before investing in it. I hope you liked our list of Copyscape alternatives for 2019 and beyond. While the free tools listed here do a good job detecting traces of duplicate content (and some even generate a report of unoriginal content), nothing beats the premium tools listed in this article. Grammarly ( Get Discount) – best plagiarism checker so far that sums up as a grammar & punctuation checker & will improve your English on the go. CopyGator – covers up Copyscape features like Copysentry to to regularly detect website content scrappers. What is your workaround for Copyscape? Did I miss your favorite Copyscape alternative? Please comment below so we can try ’em! Check Your Content Plagiarism Now!